Canon D60 with EF/50mm lens stopped to f/2, single 300 sec exposure at ISO200, no dark subtracted. Widefield imaging with the D60 at the MAG-6 Star Party in Eibisberg/Styria in 1200 m at 11 degree C.
Bottom: Southern Milky Way - some light pollution above the town of Weiz. levels and color balance adjusted in Photoshop, gradient removal to reduce sky glow; images reduced to 40-50% size. Single 120 sec exposure at ISO200; no dark subtraction, levels adjustments light unsharp mask in Photoshop; Size reduced to 50%, cropped. Widefield Cassiopeia, Perseus, Andromeda and Triangulum at high transparency and +15 degree C.
Single 300 sec exposure at ISO200; Dark subtraction, levels adjustments and gradient removal in Photoshop; Size reduced to 50%, cropped. View from observatory north with big dipper and Polaris at +10 degree C during jetstream and 3/4 moon behind trees. The lighten function during combining attenuates the star trails,while leaving the non moving parts as it is. First success with the H-alpha filter at icy -15 degree C and 1/2 moon up. The image consists of 2 unfiltered shots each 300 sec at ISO 100 and f/2.5 combined with 2 H-alpha filtered images each 300 sec at f/1.4 and ISO800; darks subtracted, H-alpha channel mixed to the red and luminance channel, levels and curves adjustments, size reduced to 40%, as slightly defocused. The raw H-alpha image can be seen in the Canon D60 review at bottom: here (57kB). Finally 5 flares appeared with these 12 minutes! I tried to work out the colors of the dark matter obscuring the bright areas. The seams are not perfect due to the distortion of the lens. 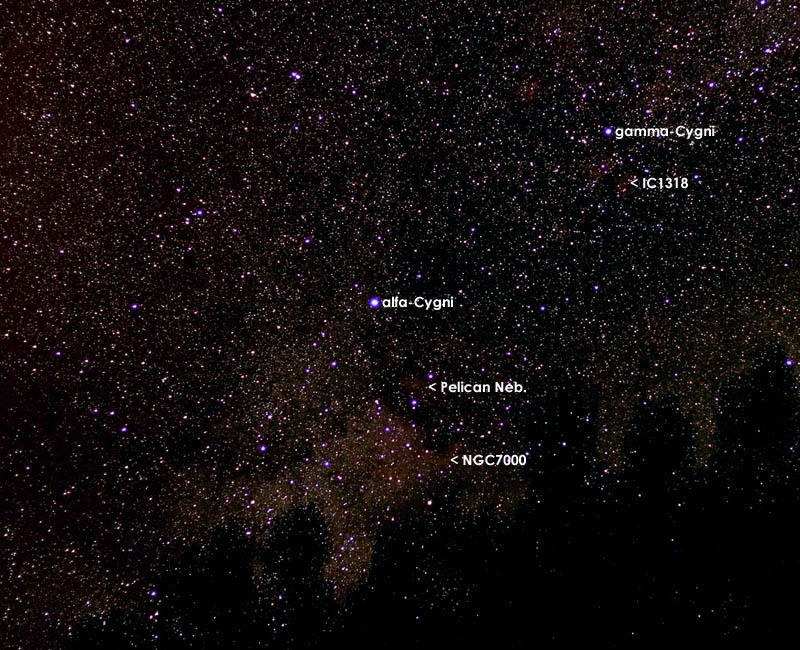 The image extents from Saggitarius through Cygnus up to Cassiopeia.